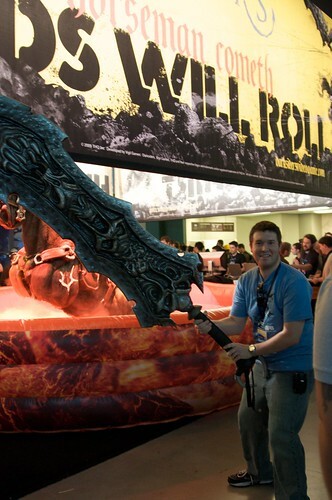 If there is one single player action game on the PAX showfloor that put on a show, it was Darksiders. 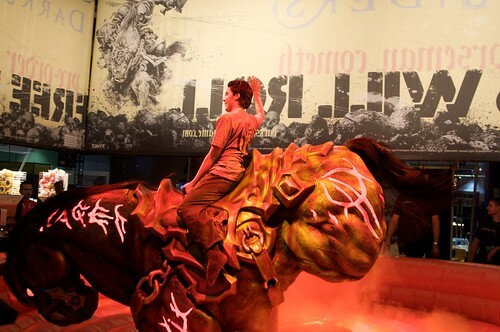 Next to their demo consoles, they had a giant riding bull that they skinned to look like Wars (the main character of Darksiders) Horse. This got our attention as well, and we stopped by for a test ride of the game itself. 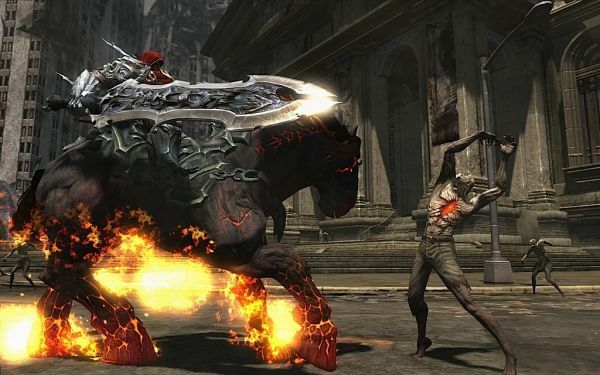 Darksiders follows one of the Horseman of the Apocalypse, War. As you may know, there was supposed to be 4 Horseman, but co-op was cut from this title. This action adventure game had best been described as a Zelda meets (or, meats) God of War with a robust hero and loads of destructible environments. Yes, people rode this thing. What really caught my attention was all of the exploring you get to do. Instead of just hacking at your enemies, you can throw a car at a group of them, then go find some treasure chests! We were short on time for this demo, but here is what we've got. Editors note: We couldn't ask about the lack of co-op, as the developer I was scheduled to meet with wasn't around. Otherwise, Arttemis was the one playing the demo while I recorded once again. They also had a really big sword. Jim demonstrates. Page created in 0.6896 seconds.